Please note:Recently some other sellers hijack our listing and sell fake item on Amazon.Also their products is not Amazon prime item and shipped from China.some buyers left true feedback on their store.Please don't buy from him. It's a beautiful dream to own such a Hollywood style makeup mirror for women and girls. 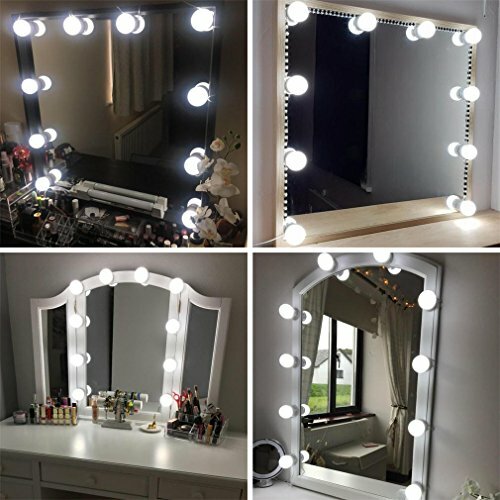 This is the best makeup mirror vanity lights, dimmable bulbs,adjustable length, easy installing. Now you can easily own it instead of buying expensive led mirror over $300 any more. Professional and clear look of these lights makes it easier to spot each detail while you doing your make up. Small body-Big power,exquisite appearance. It's amazing when your daughter ,mother or female friends receive your gift on Christmas, New Year or other holidays. Don't hesitate,choosing us,own beauty and happy! Adjust brightness while longer touching(2-3 seconds), with memory function that means the light will always stay on your desired level of brightness when last time you switched off. 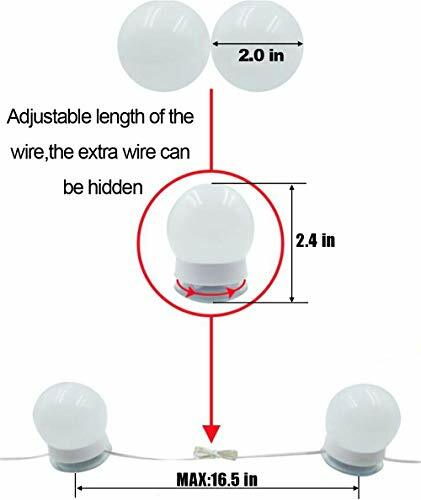 The extra wires can be wrapped and hidden around the base.DON'T have to cut off the extra bulbs at all. 1.Keep the mirror surface or frame smooth,clean and dry before installing.DON'T stick to the wall. 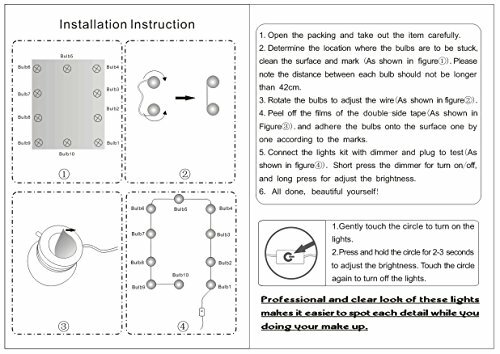 2.Press the bulbs with a little force for dozens of seconds when installing to ensure the 3M tape stick to the mirror tightly. ★10 high quality Hollywood style led dimmable bulbs with long lifespan,4500K led bulbs provide plenty of brightness to makeup in low light conditions.It is soft and not dazzling, so your eyes not be hurt by the light and it is no problem to makeup for a long time. 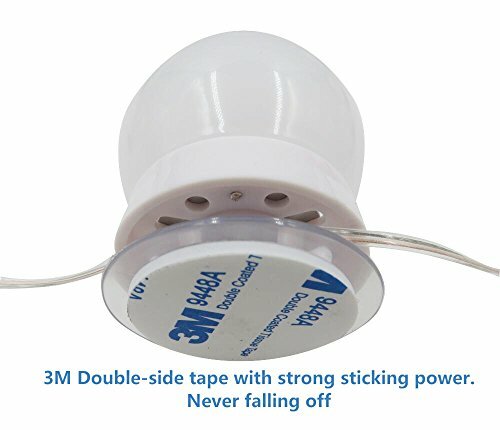 ★A flat base instead of suction cup to ensure a large enough contact area, plus the best quality 3M double-side tape with strong sticking power,NEVER FALLING OFF. 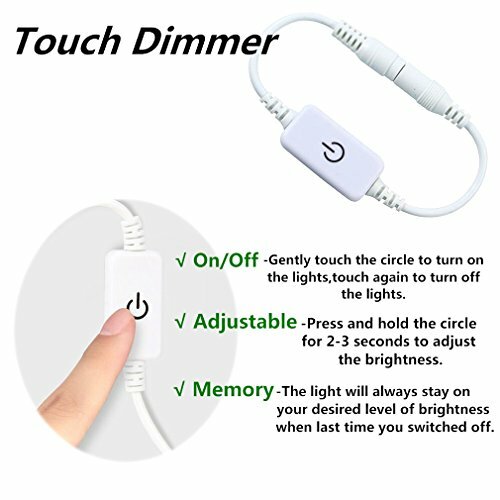 ★Turn on/off lights and adjust brightness are available with the smart touch dimmer,with memory function that means the light will always stay on your desired level of brightness when last time you switched off.And even more energy saving. 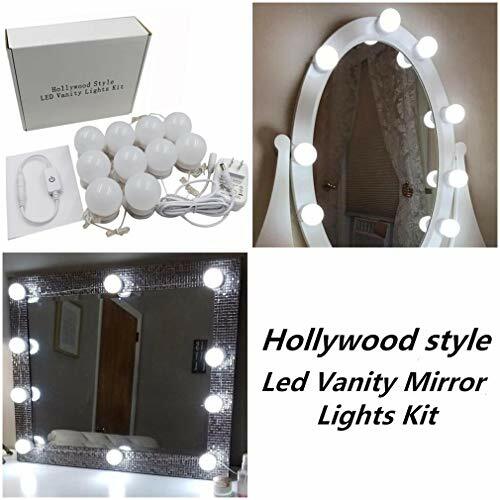 ★12.5FT/3.8m lights kit in full length(Not include the adapter and dimmer).Perfectly fits most mirrors and the extra wires can be wrapped and hidden to keep your mirror neat.DON'T have to cut off at all(Adjustable). ★Easily installing followed the instruction(included) in a few minutes without any other tools.Peel and stick,plug and play with the included safe 12V power supply. If you have any questions about this product by 321 Lights, contact us by completing and submitting the form below. If you are looking for a specif part number, please include it with your message.